Each Monday evening, preceding the 5:30 p.m. daily Mass, a novena is prayed to Our Mother of Perpetual Help. This novena invokes the protection of Our Lady on our parish community and individual families. The icon of Perpetual Help dates back to at least the fifteenth century and carries with it many miraculous stories. Our Lady is holding the baby Jesus who appears somewhat frightened. In haste, He runs to His Mother for protection and help, as evidenced by the fallen sandal on his right foot. A loser view of the icon reveals the reason for the Christ Child's embrace. The Archangels Gabriel and Michael carry with them the instruments of Our Lord's passion. Our Lady looks into the eyes of the viewers, beckoning us to go to her in time of trouble as her Infant Son did. 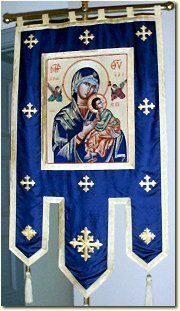 May we, too always find solace and refuge in the loving mantle of Our Mother of Perpetual Help.